Internet Scavenger Hunt Now Live! Complete the Challenge. Win Prizes. Perfection is not an accident. The new AMD A8 APU combines high performance processing cores, enabling breakthroughs in visual computing to satisfy even the most intense gaming requirements. Playing PC games with AMD technology will guarantee brilliant character augmentations and spectacular close-quarter takedowns. Your enemies won't know what hit them. 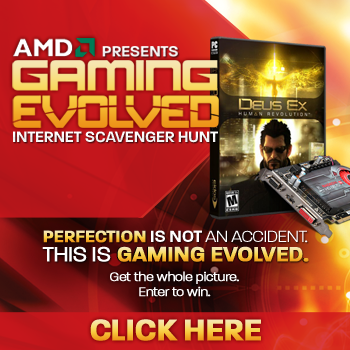 Thanks to AMD and Sapphire Technology, The Escapist community has a chance to win a plethora of AMD prizes and a copy of Deus Ex: Human Revolution. These prizes include a grand prize of Sapphire A8 APU + A75 main board and secondary prizes of a Sapphire Radeon HD 6670 GPU. To enter for your chance to win, all you have to do is take part in our Internet Scavenger Hunt. Learn about AMD's APU technology and complete the quiz. Easy peasy. Prizes are open to residents of the following seven countries: United States of America, Canada, UK, France, Germany, Poland, and Romania! To find out how participate in the event, enter the contest, and collect a new limited edition badge, head over to the contest page by clicking here. Please note: If you run into any technical issues, you may submit a bug report here.